These webinars will be free to watch until the last day of March. Monthly or Annual Webinar Members continue to have unlimited access to more than 100 webinar recordings and all 380 pages of instructor handouts for the duration of their membership. 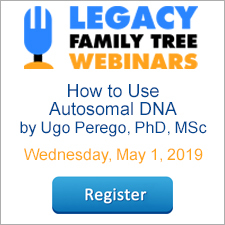 Webinar Members also receive an automatic 5% discount on everything at FamilyTreeWebinars.com (must be logged in at checkout). FamilySearch has added 2.7 million indexed records and images this week with new browsable image collections from Canada, England, Italy, and Wales. Notable collection updates include the 829,450 indexed records and images from the U.S., Georgia, County Marriages, 1785—1950, collection, the 337,856 images from the Italy, Bologna, Bologna, Civil Registration (Tribunale), 1866—1941, collection, and the 120,113 images from the new Wales, Court and Miscellaneous Records, 1542-1911, collection. See the table below for the full list of updates. Search these diverse collections and more than 3.5 billion other records for free at FamilySearch.org. Yesterday's company meeting reminded me of how fun Google Hangouts can be. With each of our Legacy Family Tree employees armed with a web camera, Internet connection, and free Google+ account, we were able to meet together even though we were spread across 9 cities and 2 countries. Google Hangouts are fun, and they are pretty easy to use. First, you need a Google+ Account. You'll also need a webcam. I use the Logitech HD Pro Webcam C910. Then, over at http://plus.google.com, click on the Start a Hangout button and invite your friends to join you. Our family recently held our first-ever Virtual Family Reunion at Christmas time using Google Hangouts. There were 7 families online from 5 different cities. With 20+ grandchildren online at the same time, you can imagine it was a little hard hearing everyone, so we took turns by having all families click on the mute button, except for the one whose turn it was to talk. Each family then talked about their latest happenings and sang a Christmas song. Sure was special to be able to share my holiday with my parents and five siblings, even though we couldn't physically all be in the same place. The great thing is that I recorded our hangout and will have it to replay. Our recent webinar speaker, DearMYRTLE, has been making use of Google Hangouts for her weekly shows. She will be broadcasting live from the Family History Library next week. Read more about it here. Or watch the recording of Dan Lynch's A Closer Look at Google+ webinar here. So if you are reading this article, or you have participated in one of our Legacy Family Tree webinars, you have enough tech experience to take it to the next level. Have fun! If you have a brick wall in Ireland or Scotland, the new Poor Law Records of Scotland may help. Join us for a free webinar with Accredited Genealogist, Judy Wight, on Wednesday, March 13, 2013. Join us for the live webinar on Wednesday, March 13, 2013 at 2pm Eastern U.S. Register today to reserve your virtual seat. Registration is free but space is limited to the first 1,000 people to join that day. Before joining, please visit www.java.com to ensure you have the latest version of Java which our webinar software requires. When you join, if you receive a message that the webinar is full, you know we've reached the 1,000 limit, so we invite you to view the recording which should be published to the webinar archives within an hour or two of the event's conclusion. Judith Eccles Wight graduated from Brigham Young University. She is an Accredited Genealogist researcher (AG) specializing in Irish and Scottish research. She worked as a British Reference Consultant at the Family History Library from 1990-2001. She is a published author in many genealogical periodicals, and is a popular genealogical lecturer and teacher. Judy is founder, past president and forever board member of Ulster Project-Utah, an ecumenical peacemaking organization that brings Catholic and Protestant teens from Northern Ireland to various established centers in the U.S.
She will also be presenting A Treasure Trove of Irish Websites on April 17, 2013. FamilySearch Records Update: 10.5 million new records from Brazil, Indonesia, Italy, New Zealand, Peru, and U.S.
FamilySearch added an additional 10.5 million indexed records and images in the last two weeks. The largest portion of this update includes the 8,613,673 images added to the New York Probate Records from 1629 to 1971, increasing this collection’s images by 63 percent. Other notable collection updates are the 699,800 indexed records and images from the Brazil, Rio de Janeiro, Immigration Cards from 1900 to 1965, and the 307,448 images from the Peru, Lima, Civil Registration from 1874 to 1996. See the table below for the full list of updates. Search these diverse collections and more than 3.5 billion other records for free at FamilySearch.org. When I began researching my ancestors more than 22 years ago, I started with my maternal line. Upon reflection, that may not have been the best choice because women are often much more difficult to trace than their male counterparts. March is National Women's History Month, and the perfect time to research your female ancestors. Whether you're just beginning or have hit a brick wall in your search, here are a few tips to get you on track to tease out those maiden names and focus more on the women in your family tree. 1. Fill in the blanks. Choose a female line to focus on. If you’ve got a number of maiden name blanks (Anna __or Mary __) on your family tree, make it your mission to try to find those maiden names. Not sure where to begin? Need a refresher course? View the Chasing Women: Finding Your Female Ancestors webinar, or pick up a copy of the Finding Female Ancestors Legacy QuickGuide™(Print, or PDF). 2. Learn about the time period. To make sure you’re not overlooking important sources, you should always learn the federal, state, and local laws that influenced your female ancestors’ rights for voting, naturalization, and other matters. For example, you can learn more about Women’s Suffrage from the National Archives, Archives Library Information Center (ALIC), or dig into special manuscript collections or Harvard University Library’s Open Collections Program “Women Working, 1800-1930” to research women’s occupations. Find even more special collections via the National Union Catalog of Manuscript Collections (NUCMC). Enjoy other educational opportunities by attending a women's study lecture (check with community organizations or libraries in your local area for special events), or self-study sessions on the Library of Congress website, or History.com. 3. Tell “her” story. Give voice to your female ancestors by telling their stories. The research I did on my maternal lines eventually became the foundation for my first book, Three Slovak Women, in which I pay tribute to my mother and grandmother. If writing a book seems a bit too ambitious, try a smaller project. For example, you can write a series of profiles about different female ancestors and create a Blog where you can post them for others to read and enjoy. If you need help coming up with topics consider participating in the “Fearless Females” Blogging Prompts Series on my blog, The Accidental Genealogist. 4. Create a photo collage or remembrance. If writing is not your thing, then tell the stories through images or video. They say “a picture is worth a thousand words.” Truly nothing evokes emotion like a photograph—especially one of a favorite female ancestor. Create a simple photo collage that can also double as a photo timeline. First, if you haven’t done so already, scan some images of your favorite females. The Flip-Palmobile scanner can help you get the job done. Print the images (at home if you have a photo printer, or use a local printing service). To get your images looking just right, pick up a copy of Geoff Rasmussen’s Digital Imaging Essentials. Then, purchase an inexpensive segmented collage frame at your local retail store, and insert your printed photographs. One option is to create a traditional multi-generational theme, showing several generations of women from the same family tree (e.g. you, your mother, your grandmother, great-grandmother, etc.). Alternatively, you can get creative and use themes such as holidays (your female ancestors at Christmas, Easter, etc. ), or a broader theme such as family gatherings (baptisms, weddings, vacations or other special events). Another great idea is to create a photo story book or scrapbook (services such as MyCanvas from Ancestry.com, Shutterfly, or Snapfish, allow you to create customizable books or other keepsakes of different styles and price ranges. For something even more special, you could create a video, using a service such as Animoto—an online service where you can quickly create a video using still images, music, and text (their free service limits you to 30 second videos; pricing plans are available for longer videos). 5. Preserve precious memories or memorabilia. If you’re fortunate to have a female ancestor’s diary, scrapbook, or other treasure, consider turning it into a digital preservation project. Susan Peterson, who writes the Long Lost Relatives blog, found an interesting was to preserve her great grandmother’s autograph book using SlideShare. I hope to do something similar with my mother’s autograph book. In addition, there are plenty of other projects you can do such as heritage crafts, quilts, and even recipe books. I don’t know about you, but I can’t wait to get started on my list of projects to celebrate the fabulous females in my family. Lisa A. Alzo is a freelance writer, instructor, and lecturer. 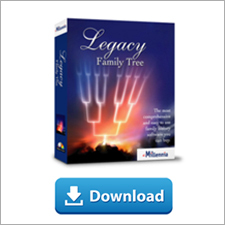 She is a frequent presenter for the Legacy Family Tree Webinars series. If you could not make it to the live event or just want to watch it again, the 1 hour 30 minute recording of Behind the Cheese Curtain: A Look at Wisconsin Genealogy Resources is now available to view in our webinar archives for free for the next 7 days. It is also available to our monthly or annual Webinar Members. Visit www.FamilyTreeWebinars.com to watch. The special discount coupon of wisconsin that was announced during the webinar is valid for 10% off anything at both www.LegacyFamilyTreeStore.com and www.FamilyTreeWebinars.com through Monday, March 11, 2013.